Why Join United Faculty of Florida at UCF? Our UCF faculty union is our collective voice. The more members we have, the more united and powerful we are together. The more the Administration notices our collective power, the more say we have in making UCF the kind of university we all want it to be. 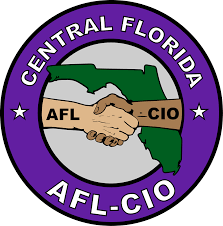 Florida is one of 27 “right-to-work” states in the country. UCF Faculty are in our Bargaining Unit, i.e. you are covered by the Collective Bargaining Agreement that UFF negotiates, but you’re not a member unless you explicitly fill out a membership form. Faculty should have a say in how UCF is run and in how we educate students. The administration should listen to Faculty when making decisions that affect us and our students. There should be a better balance of power between Administration and Faculty to facilitate better dialog and outcomes. UFF at UCF values academic freedom and labor for both Faculty and students. Working conditions for Faculty make better learning conditions for our students. Our Faculty union is our collective voice. Our mission is for membership with UFF to be transformative and not transactional. UFF members are encouraged to join volunteer committees. One important benefit of membership in UFF is that you will have representation by an experienced UFF grievance officer if you’re ever in a situation where you believe your rights have been violated. We emphasize that only dues-paying UFF members can get this help. As of November 5, 2008, UFF cannot represent you in grievances if you were not a dues-paying union-member at the time a violation of your rights occurred. Here is the UFF’s official non-representation policy. You cannot wait until “something happens” to join the union. As a UFF member, you automatically receive certain benefits, such as $1 million employment liability coverage and two free 30 minute consultations with a participating attorney each year. Take advantage of the many other benefits available: loans, mortgages, insurance, and discounts on hotels, car rentals, cellular phone plans, and even pet insurance. It is entirely possible to save more money from the discounts than you pay in dues annually. Be sure to explore member benefits available from both NEA and AFT since you belong to both national organizations through UFF. If you’re in the Bargaining Unit, you can join. This includes tenured and tenure-track faculty but also includes instructors, lecturers, librarians, visiting faculty, and other professionals at UCF. Membership dues are 1% of your gross salary. Note that if you are on a 9-month contract, dues are only 1% of that 9-month salary; anything you earn during the 3 months of summer (from teaching, external grants, etc.) isn’t included when calculating the 1% dues. The application form for membership in UFF is available as a PDF file. Inputting your name and email does not mean you’ve joined the union. You must print and fill out the form. The form must be submitted in person or by mail. We take the form and ensure that the original goes to the UCF Personnel/Payroll Deduction Office so that dues will come automatically out of your paycheck. Also, one copy stays here in our chapter’s files, and another copy goes to the UFF state office in Tallahassee. The union leadership encourages union members to develop meetings and social events within your own college. Expenses incurred during meetings with non-members to recruit new union members are eligible for reimbursement. Please contact the chapter president at president@uffucf.org to inquire about developing a new event, or to receive a reimbursement. Learn more about talking to other faculty. UFF-UCF includes a chapter of UFF for “at-large” faculty not within the bargaining unit. Members are able to enjoy the same benefits as faculty in the bargaining unit. Fill out this form if you want to be an at-large member of UFF. The annual dues (as of the 2017-18 academic year) for an at-large member are $510.53. Retired faculty can also be a part of UFF, in the same chapter as “at-large” member. Here is the form you need to fill out if you are retired and want to be a member of UFF. The annual dues for a retiree are $86.00; the lifetime-member dues are $450.00 (though note that in order for you to receive the NEA life membership that comes with that, the member must pay the $450 before retiring from the position). Both of those dues are current as of the 2015-16 academic year. Need to find a union-friendly lawyer? The AFL-CIO (of which AFT is affiliated) maintains a database of lawyers on its “UnionPlus” website. On that form, fill in the zip code and specify the state as “FL”. If you want to choose a union, choose “AFT” or “Teachers”, although when last checked (October 2014), that didn’t seem to affect the list of lawyers that the form returns. You also may call 1-888-993-8886, M-F 9:00 to 7:00 ET, for legal-aid services, including some free consultation time! Our union Bylaws establish UFF-UCF’s rules of order, committees, duties, and meetings. These Bylaws and our Constitution were created and adopted unanimously by our members on March 25, 2018.